We spent our morning driving up the coast toward the Bay of Kotor, stopping along the way to check out the beautiful Adriatic scenery. 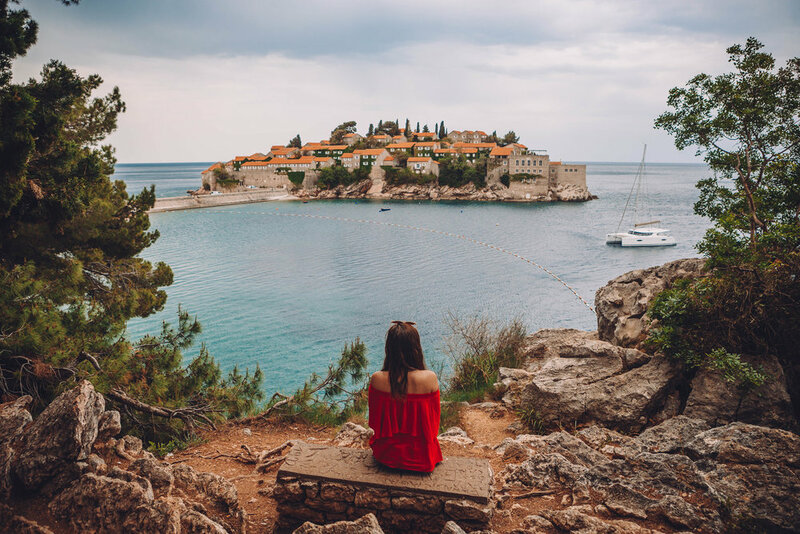 We found some parking near the town of Sveti Stefan and took a nice stroll through the town's waterfront park and beach complex. The pleasant weather, smell of the ocean and sight of the typical stone pine trees hanging unceremoniously over the glimmering turquoise water made for an exceptional little jaunt. Adding to the near-illusory environment was the world famous Sveti Stefan, which is pictured above. The small islet is home to a 5-star resort, and entry is reserved solely for the lucky guests of said establishment. At least we could enjoy its visage from afar. Later in the afternoon we arrived at the Bay of Kotor; a large, picturesque inlet off the Adriatic sea. The bay is home to a number of historical settlements including the old city of Kotor itself, which has been an active area since the Roman occupation around 2,000 years ago. We checked into our Airbnb and were greeted with some warm hospitality provided by its proprietor Branco. Branco showered us with homemade baked goods, never ending rounds of local bottled beer and enriching conversation about every topic under the sun. Branco struck us as a guy who's kind of got it all figured out. After traveling the world as a commercial sailor in his younger years, he returned home to Montenegro and opened his apartments. Now his days consist of baking, maintaining and improving his rentals and spending time with his guests from all around the world. At one point he said something along the lines of, "I've already lived a life filled with travel around the world, now I let the world come to me", and that seemed like a pretty gratifying life to us. Buzzed from the beers and hospitality, we wandered to Kotor's nearby old town (pictured above) in time to enjoy a leisurely walk before retiring for the night as dusk fell.